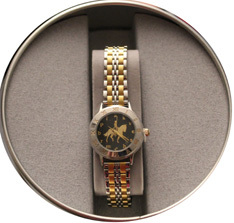 AWST, Tempi: Equine Wrist Watches for Any Horse Lovers! • Gift Set 3 pc. 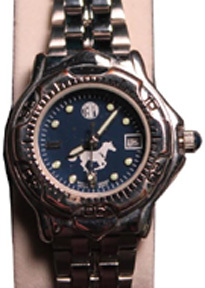 Running Horse / Navy Dial #S7LX: Exhibits its very own specific style with Running Horse Silhouette. This timepiece, both chic and elegant and fitted with Chrome case and Chrome Bracelet fitted with an adjustable buckle with security push-pieces. 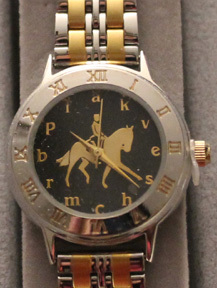 It is designed for equine enthusiasts and is worn with a Black and Brown Straps. Displays the time clearly, and offers calendar date in aperture at 3 o'clock. The dial comes in Navy-colored tone and is enhanced by traditional hands. Comes in a eye-catching Snaffle-Bit Gift Box. Great gift idea! ORDER NOW! • Dressage Black Dial Two-Two Chrome #PD03L: This eye-catching ladies watch is the ideal accessory to any casual, professional or formal outfit. The two-tone bracelet offers durability, and the sliding clasp keeps it secure on your wrist. The Black Dial and the gold-tone Dressage contrast the case and bracelet for a classic feel gives you smooth and correct timekeeping. 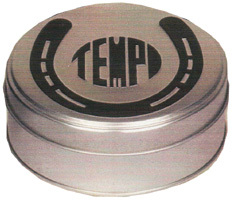 Comes in a Tempi Gift Tin. Great gift idea! ORDER NOW! • Pearlized Dial Arabian Horse #PD03L: This eye-catching ladies watch is the ideal accessory to any casual, professional or formal outfit. The two-tone bracelet offers durability, and the sliding clasp keeps it secure on your wrist. The Black Dial and the gold-tone Dressage contrast the case and bracelet for a classic feel gives you smooth and correct timekeeping. 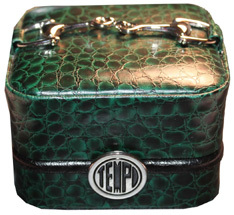 Comes in a Tempi Gift Tin. Great gift idea! ORDER NOW! 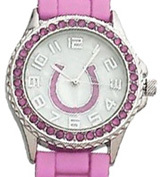 • Rhinestone Horseshoe Watch: Light Pink Band: Casual and Sporty all in the same watch. 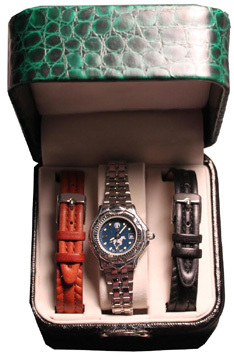 Rhinestone Horseshoe Watch features a Black/Brown/Red Silicon textured strap with a smooth feel and a stainless steel case. 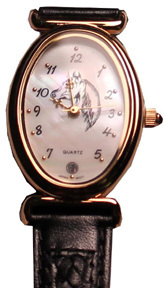 The White Dial has a glittering red horseshoe and large easy to read numbers. 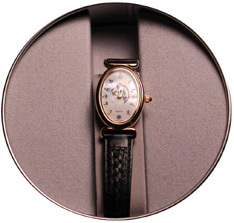 This unique, modern watch is adorned with 36 Rhinestones sparkle around the bezel of this brilliant watch. Will fit from a 6 to 8 inches diameter wrist. Water Resistant and Japanese Quartz movement for accurate timekeeping. Great gift idea! ORDER NOW! Lila Galloping Horse Reading Glasses: Readers have a movie star appeal and a beautiful design with these Equine Reading Glasses. Adorned with Rhinestones and studs on the frames adding just a little bling to the classic style readers. 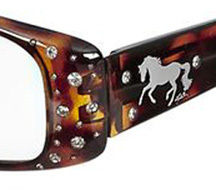 Brown and Black frames with an ornate "Lila" galloping Horse logo provide a sophisticated and cultural design. Great gift idea! • Lila Galloping Horse Reading Glasses: Black Frame. Available Magnification: 1.5, 1.75, 2.0 and 2.25. Great gift idea! ORDER NOW! • Lila Galloping Horse Reading Glasses: Tortoise Frame. Available Magnification: 1.5, 1.75, 2.0 and 2.25. Great gift idea! ORDER NOW!